country’s first mobile panic button and country-wide coverage. Once activated the CASI app broadcasts your location to all the nearest responding partners as well as our 24 hour Command Centre that can track you in real time and assist the responder by providing them with all the required information. Our armed responders will be notified of nearby emergencies as well as be navigated to the location of the smartphone that has activated the panic. On arrival the completion will be validated with a unique code. Make use of our smartwatch extension to activate a panic in a situation where your phone is not within direct use. You remain informed of the expected arrival based on the responder’s live location. Safety at the press of a button. 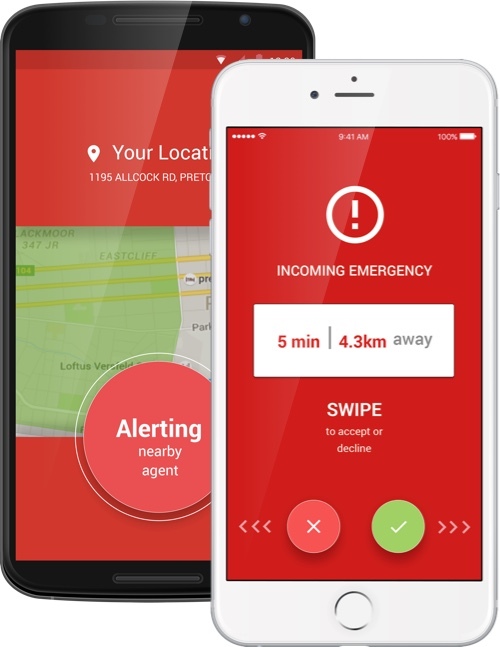 Our unique wireless panic button works within 30 meters of your smartphone and offers a weather durable solution for direct access to security. Mount the button on your bicycle, car or even on your clothes and backpack to ensure you can easily access the button no matter what the situation is. Safety right from your home screen. With our Android widget it is now even easier to activate a panic not having to open the application but rather activating a panic directly from your homescreen. With the unique CASI anti false alarm trigger you can always feel safe with your phone nearby. Access to over 150 trained armed responders anytime, anywhere.